Our President, Kate Dilks, welcomed 50 members and 1 visitor to the July meeting. Coffee hostesses and flower arranger were thanked. 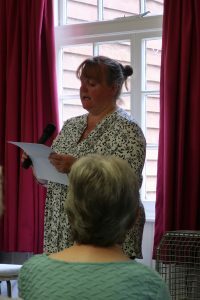 Fiona Steward from Hastingleigh WI had been our delegate at the WI AGM in Cardiff and she gave us an interesting report. The resolution “Mental Health Matters” was passed by 5,945 votes to 103, a 98% majority. Dates for diaries. September 18th, the Lunch Club will meet at The Bell in Hythe. For more details please click here. October 4th, a visit is planned to Chatham Dockyard. For full details please click here. October 25th, the Top Team Quiz is being Held at the Canterbury Academy and we are hoping to field at least one team. December 4th Christmas Lunch at Lympne Castle. 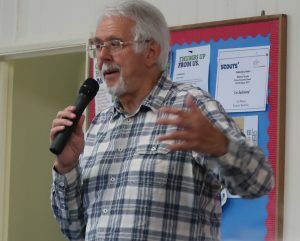 After coffee, biscuits and chat we welcomed Chris Hare whose talk was entitled “40 years without a proper job” but as he pointed out that wasn’t quite true. Chris gave us some details of his background. His father was a professional pianist who played with all the major bands of his day and his mother was a model for Bear Brand stockings. And that said Chris was where he got his talent for performance and his legs! He worked as an entertainments manager, a theatre manager, and a production manager. What followed was 45 minutes of hilarity and laughter as Chris regaled us with anecdotes and jokes about the stars and performers he had met and things that had happened to him during his career. 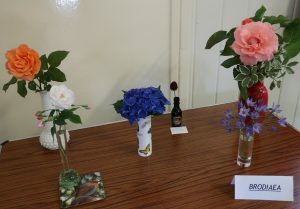 Kate Dilks gave the vote of thanks and the competition for a garden flower, was won by Julie Andrews. For details of our next meeting please click here.